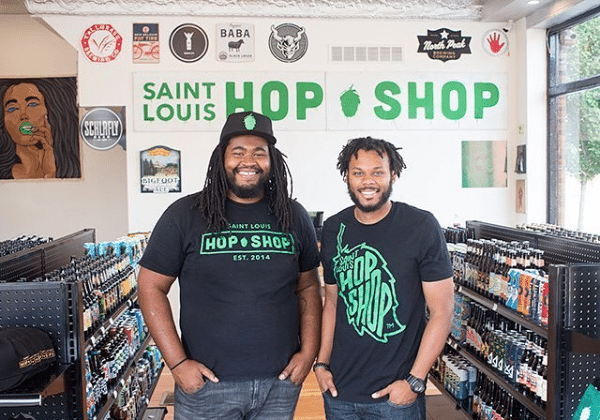 So my question to you is…What’s Popping at The Hop Shop? If you haven’t heard St. Louis has it’s very own upscale beer café, it means you have been living under a rock. Located in the ever growing Cherokee community, the Hop Shop is the one to talk about, visit, and buy a beer or two from. Owners Justin Harris and Ryan Griffin are doing the darn thing by offering us wall to wall selections and they have the dopest art on their wall by local St. Louis artists. The idea of owning a beer cafe sprung about when these two great minds came together after Justin moved back St. Louis. Each of them realizing the number of breweries surpassed the number of bottle shops. For them both, to own a bottle shop was a necessity. ” The idea came from wanting a good selection of beer and not having to travel far from my home to get it,” said Justin. Standing out from your usual corner liquor store, the ambiance on point. The Hop Shop offers craft beer from all over. Being an entrepreneur is no easy task, even though these two make it look easy. Though they both admit it is a challenging, frustrating experience, neither of them would trade it for the world. They have both given themselves to their dream. In all honesty, it is truly the place to be. It’s almost as if Cherokee chose them. Justin and Ryan wanted to be in the inner city, in an up-and-coming area that adds diversity. One that has a sort of vibrancy and is filled with culture. Now if we’re being honest, beer shops are popping up all over. 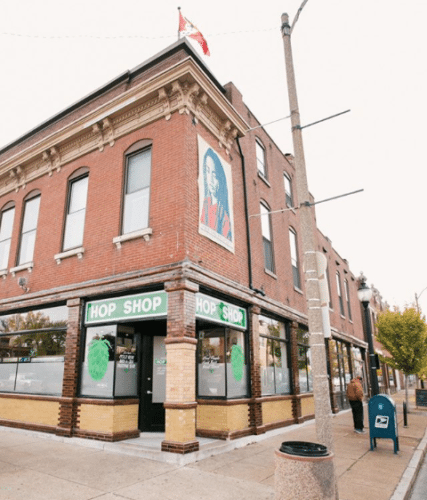 Though the Hop Shop stands out because they are a part of the very few bottle shops or I like to call beer cafes that strive to have the best beer. The cherry on top is when you walk into the Hop Shop, you are welcomed like you are family. Since Justin and Ryan are cousins, when their customers come in they leave feeling like–kinfolk. Justin and Ryan are no strangers to giving a warm smile, and a hand shake. Hearing tunes over their air waves like Anderson Paak or Chance the Rapper, the Hop Shop kind of makes you feel like your at a kick back chilling with friends. Whether you’re sitting at the bar discussing beer, art or what ever topic comes up, you can be sure the TV will have some sort of sport on too. With a place like the Hop Shop, there should be two right? [ Justin and Ryan just putting it out there]. Well eventually, but for Justin and Ryan, right now they are focusing on fine tuning their gem of a baby on Cherokee.